This Guarantee Will Increase Your Business…Guaranteed! This is a great example of a business in a competitive, yet boring, business doing something really awesome with their marketing. It involves the use of a powerful tactic that many businesses don’t take advantage of (and those that do, don’t execute it nearly as well as this business does)…the guarantee. If the business in the example below can have a guarantee as effective as this, any business can. Pay close attention to what they’re doing here because I have no doubt it can easily double or triple the conversion rate for some of your businesses. Before we get there, let’s back up a bit. Why even talk about guarantees in the first place? Well, for one, you want to make things as easy and risk free as possible for clients to do business with you. Offering a guarantee is a great way to reduce the risk. And it’s a powerful way to stand out from the competition…if they’re done right. And that’s a big “if” because often they’re not done effectively. Just having a 30 or 60 day money back guarantee is great…but it’s almost becoming the norm these days in many markets. So how do you do guarantees the right way? Let’s get back to that example I mentioned. This is from a dentist’s office in Virginia. No offense to any dentists reading this, but a dental practice is a boring business. No one gets up in the morning, springs out of bed and shouts “Yipee! I get to go to the dentist today!”. Going to the dentist is just something you gotta do. And, in any decent size metro area, there are hundreds of dentists to choose from. 2. People are really busy and don’t want to waste precious time waiting around a dentist’s office all day. They want to just get in and out of there as quickly as possible. So this office guarantees you won’t spend more than 15 minutes in the waiting room. 3. Patients want to make sure the work is done right the first time and they’re not going to have to pay to fix it if it isn’t. So the office offers a lifetime warranty for crowns, veneers, and onlays (as long as you do your part and come in for regular cleanings…which is another stroke of genius because it encourages people to stick with this dentist’s office for the long term). Second, it’s unique. I’ve never seen another dentist doing something like this before. And it definitely makes this office stand out from the competition. Third, it gives them credibility. It shows they understand the issues dental patients are concerned about and that they, too, care about those issues. It demonstrates that they’ve put a system in place that they’re so confident in, they’re willing to back it up with this guarantee. And, lastly, it makes for a very compelling offer. If I’m looking for a dentist and come across something like this, it’s hard to pass up. 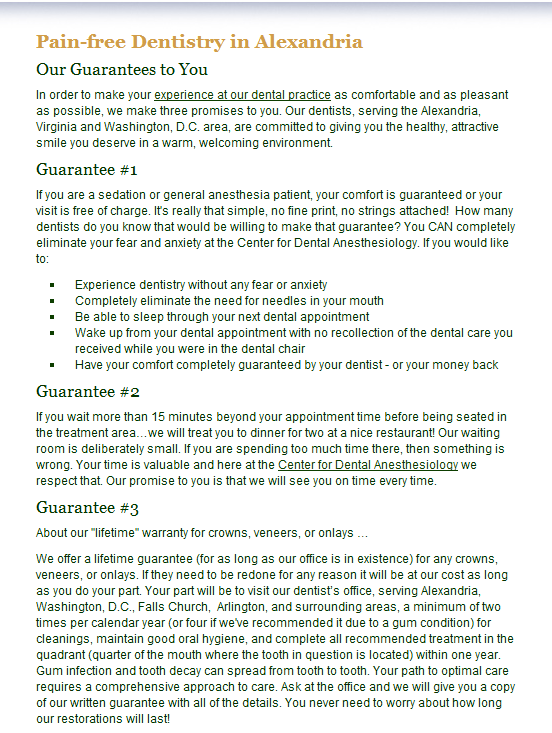 I mean, none of the other dentists are backing up their promises with a strong guarantee so what’ve I got to lose here? There’s competition everywhere these days. Your job in marketing is to eliminate it. And you do that by being unique…offering things your competition doesn’t…proving your credibility…understanding your customers better than they do. Offering a strong, ballsy, well-structured guarantee that your competition isn’t willing or able to make is an incredibly powerful way to stand out from the competition. Come up with a good one like this dentist’s office and you’ll see an immediate boost in your conversions…I guarantee it!